Here are just a few stories from ENB-funded English classes that exemplify what we know to be the true immigrant experience — people who are strong, bold, and driven. As she was on the way home from the interview, she received a call on her cell phone. The manager said, “Diana welcome to Copa Airlines!” Diana says that it is a dream job, and she works hard everyday to learn the computer system and new vocabulary. She loves her job and feels very proud. Immigrants — over 800,000 in Massachusetts alone — bring their dreams, their grit, and their determination to America every year. It’s that rich diversity, we believe, that makes America great. In this past year, ENB’s work with immigrants — offering English language classes that are gateways to a new life in America — has, perhaps, meant more than ever before. Thank you for supporting immigrants and believing in an inclusive, progressive America. This week, I was in a classroom full of moms, dads and grandparents at the Blackstone Innovation School in Boston’s South End. They come from around the globe — Columbia, Nigeria, Somalia, Honduras, Dominican Republic — but all are here in this ESOL for Parents and Caregivers class for the same reason: to learn English so that they can help their children excel in school. This month they’re preparing for parent-teacher conferences, practicing at-home reading strategies, and planning to attend the school’s Parent Council meeting–many for the first time. They are learning a language, but they are also becoming a small community, a group that can depend on and trust each other when times get tough and worries become overwhelming, as they often have in the past year — a border wall, travel bans, bigoted rhetoric, and now TPS elimination. Amidst it all, they have hope and a belief that things will get better. We are all friends in this class. We help each other. “We are all friends in this class. We help each other,” said Istahil, a mother of four from Somalia. Their English class gives these immigrants a safe place to ask questions and share their stories. And, as a supporter of these classes, you have given hope and shined a light in these often dark times. Next week, as we give thanks and reflect back on the year, I will be thankful for all of you that have lifted up our immigrant communities, made Massachusetts a safe place to work, live and dream as an immigrant, and opened your hearts in displays of support throughout the year. 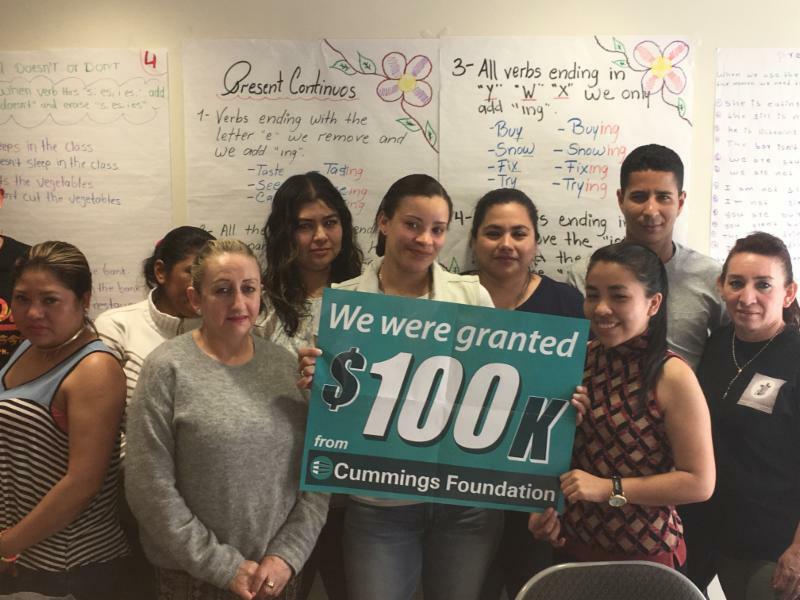 A partnership between English for New Bostonians (ENB) and Boston Cares is one of 100 local nonprofits to receive a grant of $100,000 each through Cummings Foundation’s “$100K for 100” program. The Boston-based organizations were chosen from a total of 549 applicants during a competitive review process. ENB supports 25 English for Speakers of Other Languages (ESOL) programs for low-income immigrants across the city of Boston, reaching approximately 1,100 students every year. Boston Cares mobilizes individual and corporate volunteers who strengthen communities and improve the lives of people in need, engaging thousands of adults, children, teens and corporate partners annually serving 67,000 hours at 165 schools and nonprofits. The ESOL Tutor Corps will add in-class, small group, and individualized assistance for 210 students each year, allowing them to attain their economic, educational and civic goals more quickly. Representatives from ENB and Boston Cares will join approximately 300 other guests at a reception at Trade Center128 in Woburn on June 8, 2017 to celebrate the $10 million infusion into Greater Boston’s nonprofit sector. With the conclusion of this grant cycle, Cummings Foundation has now awarded more than $170 million to local nonprofits. The Cummings grant will allow us to expand and accelerate this work, leveraging more volunteers for one of Boston’s most pressing needs. “Partnering with English for New Bostonians, Boston Cares has introduced new ways to recruit and retain ESOL volunteers. The Cummings grant will allow us to expand and accelerate this work, leveraging more volunteers for one of Boston’s most pressing needs,” said Boston Cares Executive Director Patrice Keegan. ENB and Boston Cares will expand their joint volunteer initiative, the ESOL Tutor Corps program, which helps adult immigrants learn English and gain confidence and skills to fully contribute as workers, parents, and community members. Volunteers in the Corps are exposed to rich experiences working directly with immigrants as part of a well-organized team, while building ESOL programs’ capacity to reach more students.With Cummings Foundation support, ESOL Tutor Corps will build ESOL support infrastructure on a citywide level while ensuring distinct needs of hard-to-reach immigrant students at community programs are effectively met. The Cummings Foundation grant comes at a time when both volunteers’ good will and immigrant students’ language acquisition needs are at record-high levels. Since November 2016, ENB has seen a 100% increase in individuals wishing to volunteer to assist immigrants. The $100K for 100 Program supports nonprofits that are not only based in but primarily serve Middlesex, Essex, and Suffolk counties. This year, the program is benefiting 35 different cities and towns in the Commonwealth. Through this place-based initiative, Cummings Foundation aims to give back in the area where it owns commercial buildings, all of which are managed, at no cost to the Foundation, by affiliate Cummings Properties. English for New Bostonians’ mission is to invest in the future of our region by creating opportunities for English language learners to pursue their educational, economic and civic aspirations. ENB programs serve 1100 students at 25 sites each year. The English Works Campaign, founded in 2008, activates unions, employers, immigrant community leaders, civic groups, and educators calling for government and private resources to sustain an ESOL system responsive to needs of immigrant workers and their employers. Boston Cares mobilizes individual and corporate volunteers who strengthen communities and improve the lives of people in need. Boston Cares builds relationships with schools and nonprofits around needs that can be filled by volunteer teams; then recruits, orients and leads reliable volunteers who get the job done. Boston Cares’ programs and service events engage thousands of adults, children, teens and corporate partners annually serving 67,000 hours at 165 schools and nonprofits.